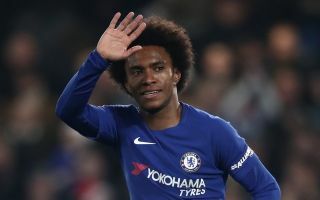 Barcelona’s interest in Chelsea star Willian has been one of the biggest transfer topics of the January window so far. The La Liga giants offered the Blues a deal worth £50million including a part-exchange for fellow Brazilian Malcom, according to The Telegraph but the bid was rejected. Willian has been a Barca target in previous windows, per The Telegraph, but Chelsea manager Maurizio Sarri is reluctant to let them have the 30-year-old. Sarri told ChelseaFC.com earlier this week: “Of course I don’t want to lose him. Willian is very important for us so I think it’s impossible to lose him in January. Willian responded to his manager’s words by scoring the winning goal in Saturday’s 2-1 victory over Newcastle United. He looks set to stay at Stamford Bridge for the remainder of the season but The Mirror claim that Chinese Super League club Dalian Yifang have put the Brazilian top of their hit-list with a summer offer likely. The Far East outfit are managed by former Germany international Bernd Schuster. Dalian were formed in September 2009 and play at a 61,000 capacity stadium. Barca may well return with another offer for Willian in the summer but may be unable to offer Malcom in part-exchange again, with The Telegraph reporting that they could look to sell him this month despite failing to replace him with the former Shakhtar Donetsk ace.